Stores reference 6B/114. Air Ministry Barometer, Aneroid, Pocket, Mark 1. By T. Wheeler of London. 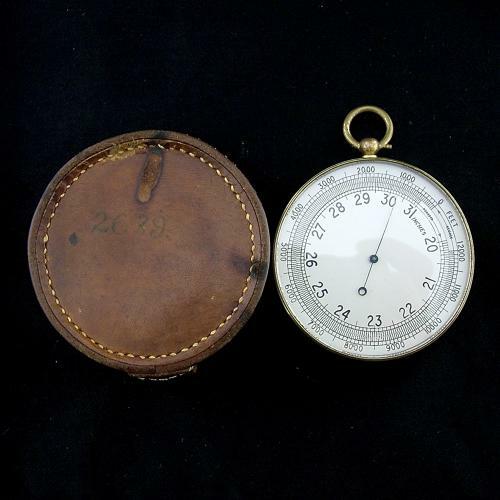 Gilt or brass metal case approximately 6.5cm diameter x 2.5cm depth with additional brass 'bow' for hanging or fitting a lanyard. Matt silvered dial with black numerals. Marked with graduations from 20 to 31 inches of mercury and zero to 13000 feet. The case has some scratches and wear but the dial is pristine and the crystal undamaged. There is an adjustment screw on the underside which is also well marked to the underside with King's crown stamp, reference details and 1938 date code. Ink A.I.D mark beneath. Comes with the original velvet lined hard leather case. A superb little instrument vital to weather forecasting on an operation RAF base. Rare to find and the nicest we have ever had. Stock code M22792.